There will be no shortage of medical discussion in daytime for the next couple years. B&C is reporting that CBS Television Distribution has renewed The Doctors for seasons three and four, taking it through the 2011-12 season. 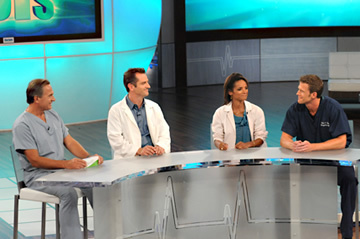 The Doctors is hosted by Dr. Travis Stork, an emergency-room physician and a former contestant on The Bachelor. The daytime program uses a panel format, with Stork consulting regularly with three other doctors — Ob/Gyn Dr. Lisa Masterson, plastic surgeon and ENT specialist Dr. Andrew Ordon, and pediatrician Dr. James Sears. Guests are often featured, including Dr. Phil McGraw (Dr. Phil) who’s also an executive producer. The two-year series renewal has been reportedly cleared in 91% of the country, including 48 of the top 50 markets. According to B&C, The Doctors averaged a 2.0 live-plus-same-day household rating last month, an 18% increase over last year’s viewership. That’s the largest percentage gain of any show in syndication right now. What do you think? Are you glad that The Doctors is sticking around? Is the show worth watching? Where is the show THE DOCTORS? The talents on the show teach me things that my own physicians have never mentioned. I appreciate what I learn from them. Now, it seems that THE DOCTORS has been replaced by name dropping gossips. Please do not “dummy down” your programming. Believe it or not, the doctors on the show kept my interest without all the cool sound effects too. Bring them back! They do not offend me; they uplift me! What happened to TheDoctors on Channel 2 , NBC. IT HAD BEEN REPLACED WITH A STUPUD SHOW. WHER CAN I FINF the Doctors !!!! What happened, not going to watch this show at 1:45am. Informative show, keep on the air, all of a sudden it was gone, no explanation, crazy ABC. This is 2013 what happened to the doctors informative show .why is it such a secret ???? Really glad that The Doctors will be on the air. I watch it whenever I can. Would really like to see a show dedicated to Bladder Cancer. I Love to watch The Doctors. Keep it on the air. do healthly things naturally as God wants us to do. TOO BAD, SHOW IS BORING. THEY GO OVER THE SAME THING ALL THE TIME. ABOUT AS BAD AS DR. PHIL AND OPRAH. now we guarantee watching The Doctors till 2012 ..